The Venerable Philip Newman, OAM recently retired from the Board of Anglican Overseas Aid after 28 years of dedicated service. He was honoured at the 2016 AGM with the following words from the Archbishop of Melbourne, Philip Freier. Archdeacon Philip Newman visited Sudan in 1986 and brought back a picture of the Church and people in overwhelming need. Philip’s visit to Sudan was ‘a stimulus to the idea of this fund’ wrote Archbishop David Penman when giving notice of the launch of the Archbishop of Melbourne’s International Relief and Development Fund (now Anglican Overseas Aid) on October 4, 1987. Philip was a member of the Advisory Committee that Archbishop Penman gathered together to identify projects, develop policy and give direction to the Fund and was appointed to the Inaugural Board in 1988. Philip played a pivotal role as Honorary Director of the Fund for a 10-year period: from September 1991 to June 2001, by which time the agency had grown sufficiently to engage a full-time CEO. He continued to be a valued member of the Board and also served for many years on the Development Committee of Anglican Overseas Aid. Through the various stages of development of Anglican Overseas Aid Philip worked closely at first with the Reverend Helen Hunter and for nine years with Ms Beth Hookey when she served as Executive Officer. For eight years of this period the parish of St John’s Toorak, where Philip was Vicar, provided rent-free office space, innumerable volunteer hands and hours of work. Philip fulfilled the role of Director with faith, vision and dedication. He was passionate about the needs of our overseas partners and continually wanted Anglican Overseas Aid to push the boundaries in order that we could maximize our response. Philip had a vision for the donor base of the Fund to reach beyond Melbourne Diocese and that resulted in the name change from the Archbishop of Melbourne’s Relief and Development Fund to AngliCORD – Anglicans Cooperating in Overseas Relief and Development – in 1996. It was due to Philip’s initiative that distinguished church leaders such as Archbishop Desmond Tutu, Bishop Riah El-Assal of Palestine, Bishop Alexis Bilindabagabo of Rwanda and Bishop Dinis Sengulane of Mozambique visited to launch Anglican Overseas Aid’s Annual Appeals. This built the foundation for the continual growth of the agency. Philip’s magnanimity is one of his outstanding characteristics. As a small largely voluntary organisation during many of the years he was Director, Anglican Overseas Aid benefited enormously from his generosity, boundless energy and sheer hard work. He visited projects that were funded by Anglican Overseas Aid in some of the most challenging places, Rwanda, Ethiopia, Palestine and Indonesia, usually at his own expense. He embraced each culture and situation, absorbing a myriad of facts and figures that ensured a comprehensive and clear analysis of the context and work being undertaken. As part of the organisational team he went to Rwanda in 1995 when travel there was still risky, at the specific request of the Archbishop of Canterbury Dr George Carey, to recommend what the Anglican Church worldwide might do in reconstituting its presence in Rwanda following the civil war. This propelled the organisation into the international Anglican networks and saw it grow as a national agency. 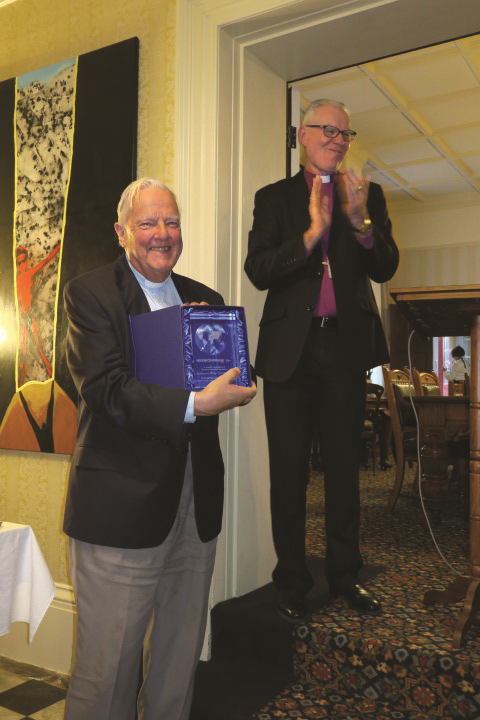 Anglican Overseas Aid owes a debt of gratitude to Philip Newman; it was a fitting tribute that Philip’s contribution to the “community through his work with AngliCORD and refugees” was acknowledged in the citation when he was awarded an Order of Australia Medal in June 2002. We pay tribute to Philip’s passion, his long-standing commitment and service and his love for the Gospel which provides his motivation.